The 2017 Funko Justice League Mystery Minis set unites more than the heroes from the League. The miniature collectibles offer a variety of options for the supes and their allies, along with a couple of villains. 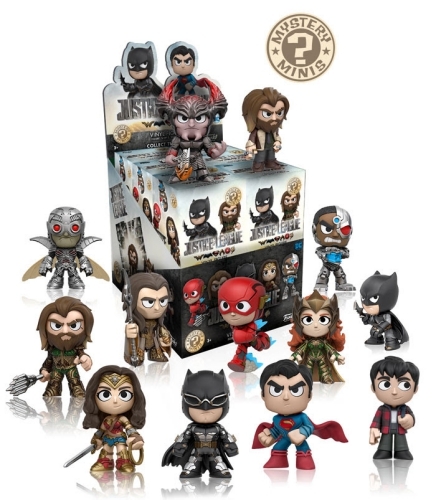 Although some of the subjects are included in DC Comics Mystery Minis and DC Super Heroes and Pets Mystery Minis, Funko Justice League Mystery Minis marks the first instance for a blind-box set based around the Justice League film. Aquaman, Batman (armored), The Flash, Superman and Wonder Woman are similar to their Pop! Justice League releases, while Author Curry, Barry Allen and Bruce Wayne present the everyday versions of their superhero selves. Countering his traditional "calm" demeanor, fans can also find a visibly angry Cyborg in the main lineup. Funko Justice League Mystery Minis reveals a few newcomers to the Funko family, too, including Aquaman's half-brother/nemesis, Orm the Ocean Master. Also representing the villains is a Parademon and Steppenwolf. Vulko, who stands nearly identical to his best friend Aquaman, is among the fresh faces as he wears gold and holds a silver staff by his side. Order Funko DC Mystery Minis Boxes on Entertainment Earth. There are at least 19 figures to discover, including a few retail exclusives for GameStop and Hot Topic, which will give those wanting to complete the set a slight challenge. This is especially true given that each case holds just a dozen figures, and a few of the Funko Justice League Mystery Minis carry tougher odds. Known odds for the Funko Justice League Mystery Minis figures are noted below. Funko Mystery Mini Justice League Aquaman, Hot Topic Exclusive, Really Cool! Check out our related Funko Pop Justice League guides for more superhero options.